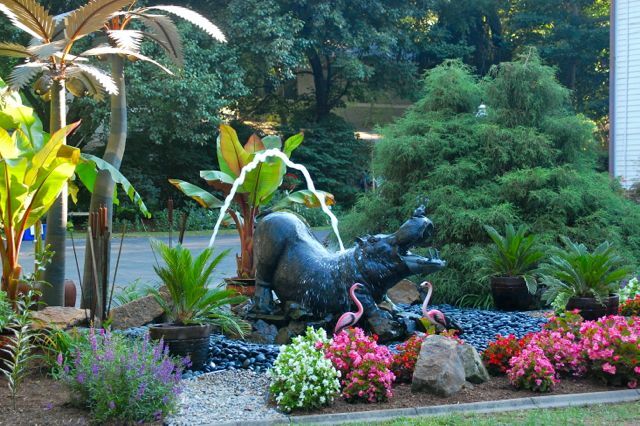 Because it’s Saturday night, and because I’m suffering from mild hippopotomontrosesquipedaliophobia (fear of long words), I thought I’d simply share one of the more unusual water features seen this year, from an Indianapolis garden. Wow…That is almost a bit disturbing. which is, apparently, the irrational fear of a hippo stealing your pyjamas. Quite why they think it is irrational I will never understand. I always keep mine within sight because you can never be too careful. It's so happy! With a bird on its nose and a delicious tickle of water on its back = a fantastic emblem of luxurious content. Talking about long words, here is the longest word in the English language: Pneumonoultramicroscopicsilicovolcanoconiosis. It proudly carries 45 letters and describes a lung disease caused by inhaling fine particles of silica dust. Now getting back to you hippo…… That water feature made me smile because that hippo looks ever so very delighted with his lot in life. By the way, Helen and Sarah, I love your blog and I visit it frequently. I have also incorporated your link within my OrchidCare.org site as a valuable resource for my visitors. Would you be willing to return the favor by placing my link within your International Gardening Links or More Great Garden Blogs? Absolutely, Hanna, you have a good resource at OrchidCare.org. You're now in our International Gardening Links.